A Martial Artist does not forever enhance this ego, he enhances it, & then he destroys it. He raises himself up, & then he lowers himself back down. He understands both. He understands the ego way & he understands the way with no ego. He knows how to be hard but he also knows how to be soft. He is gentle & sweet but he can be fierce when it is called upon for him to be fierce. He does not enjoy seeing others suffer but he understands that at certain times others will need to suffer in order to grow. Qigong is a unique & ancient Chinese exercise and healing system that allows you to enhance health & prevent illness by aligning the mind & body with Qi (“Chi”/Vital Energy). Qi is the vital energy that we are born with, the energy that we receive into our body by the food we consume and through nature (e.g. the air we breathe). The 5 Animal Frolics (五禽戲, Wu Qin Xi) is a complete qigong system, and the most ancient qigong system still practiced today. According to Kenneth Cohen, author of The Way of Qigong,”As story has it (Daoist Legend) Hua Tuo [110-207 AD/CE] received this text as well as instruction in Five Animals from two recluses living in a cave on Mount Gong Yi.” The “more recent” teachers whom are credited with spreading qigong (and Five Animal Qigong, in particular) are Madame Guo Lin (1906-1984) and Feng Zhiqiang (who learned this from his teacher, Hu Yao-zhen)*. The series of exercises that comprise the Five Animal Frolics not only help to keep the body sprightly and strong, but it engages both the mind and spirit as well. The Five Animal Frolics helps to create depth to your practice by allowing your body to communicate in different ways. We encourage everyone to find the various movements/exercises of each animal that work for you. Adding this to your training will keep you feeling young, invigorated, and well-balanced. For more information on the Five Animal Frolics you can check out any of these suggested titles: The Way of Qigong (K. Cohen), Five Animal Sport Qigong DVD (Dr. Yang), Five Animal Frolics Qigong (F. Fick) or Wu Qin Xi (Chinese Health Qigong Association). *According to Kenneth Cohen, The Way of Qigong. Wise words from a guy that reached the ripe ol’ age of 100 (and two months). The word is Qi (pronounced “chee“). We’ve heard it plenty… some of us have read up on it… but every one of us has experienced it [just most of us haven’t been aware of it]! When I speak to youngsters about qi, I often allude to the Star Wars films in which George Lucas replaced “Qi” with “the Force.” Qi is a term that means energy, or breath. It is the prime-mover of our existence and permeates throughout the universe. Breathing and its link to good health makes plenty of sense …for it’s the air we breathe, the oxygen that’s delivered to our cells and all the “energetics” at work that nurtures Life. But it’s our awareness of our breath through both moving or non-moving activities that bolsters results. Awareness: Concentrating on the “breath in” and the “breath out” focuses our mind internally and removes us from outside thoughts and common distractions. Thoughts will always enter-in (it is our nature as humans to think). But just as ripples appear on a pond… let the mind return to calm and think back to the breath as it is drawn into the body and finds its rest in the lower abdomen. A MYTH: Healthy breathing does NOT mean expanding the chest and letting as much oxygen in as possible. By doing so, oxygen restricts the hemoglobin molecules and less is released to the cells. Quality: Soft. Quiet. Relaxed. Smooth… all of these should be words to describe how you are breathing. As you breathe into your nostrils (at a relaxed, steady pace), imagine the breath going all the way down to your abdomen (aka. dantian). By bringing your breath to your dantian, even smallest blood vessels will relax and open and will enrich your body with a greater flow of blood, oxygen and qi. Natural or Diaphragmatic breathing: Breathe through the nose at a soft and steady rate and bring the breathe to the abdomen. Allow the abdomen to expand (by way of the breath, and not by your abdominal muscles pushing outwards). As you breathe out, do so by breathing out through the nose and allow the abdomen to contract/go inward. Relax: This cannot be repeated enough. The better you are at relaxing, the greater the benefits you will attain from your practice. Bring your thoughts away from school, work or any other outside distractions. If your thoughts drift… return back. Over time, over practice… the “return” will be easier and easier. Posture: There are many qigong postures and all of them will have to be adjusted slightly since we all are built differently. I have 3 basic postures that I use and they are: standing, sitting and laying. I use each of these postures throughout the day (as I am often in one of the 3 postures naturally). For instructional purposes, a standing posture should be made with a straight spine, head erect, knees slightly bent, arms by your side and the tip of the tongue resting softly behind the roof of the mouth (behind the first two teeth). For more on standing qigong, please check out Eli Montaigue’s Combative Corner contribution entitled, Three Circle Qigong. Illustrations of qigong movements are helpful, however the mother of movement will always be stillness. There are many great books that may help you to better understand qigong such as: Qigong Empowerment, by Master Shou-Yu Liang & Wen-Ching Wu and The Way of Qigong, by Kenneth Cohen… but the act of qigong is a relatively simple way to improves your health and longevity. Time, patience, willpower and correct intention are the only requisites. Us at the Combative Corner welcome your insights as well. Here are just a few of the questions we’d like to know. Please post your response in the comment section below. 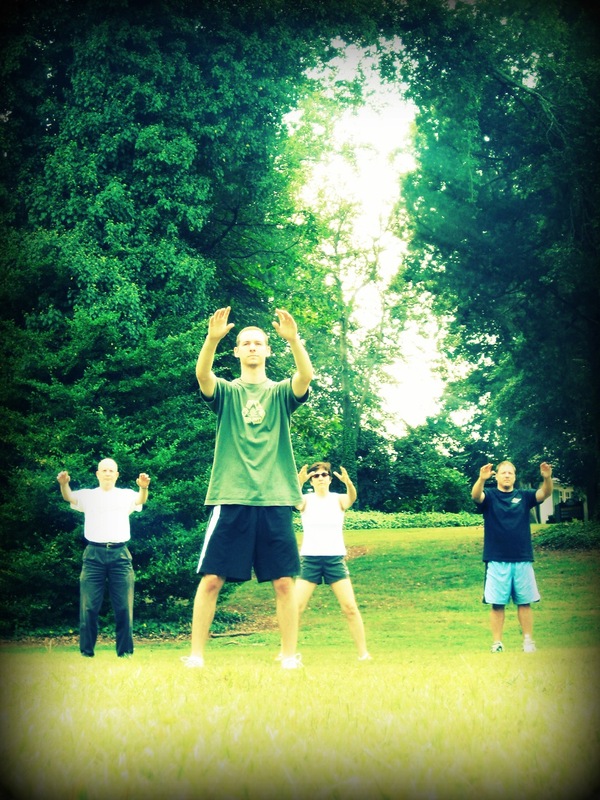 HAS QIGONG WORKED FOR YOU ? WHAT HAS BEEN YOUR EXPERIENCES ? MIGHT YOU HAVE ANY WISDOM YOU’D LIKE TO IMPART ON US ? MIGHT YOU HAVE ANY QUESTIONS FOR US OR OUR READING PUBLIC ?